Weightlifters around the world know what to expect when they hear the name Eleiko: quality and endurance. 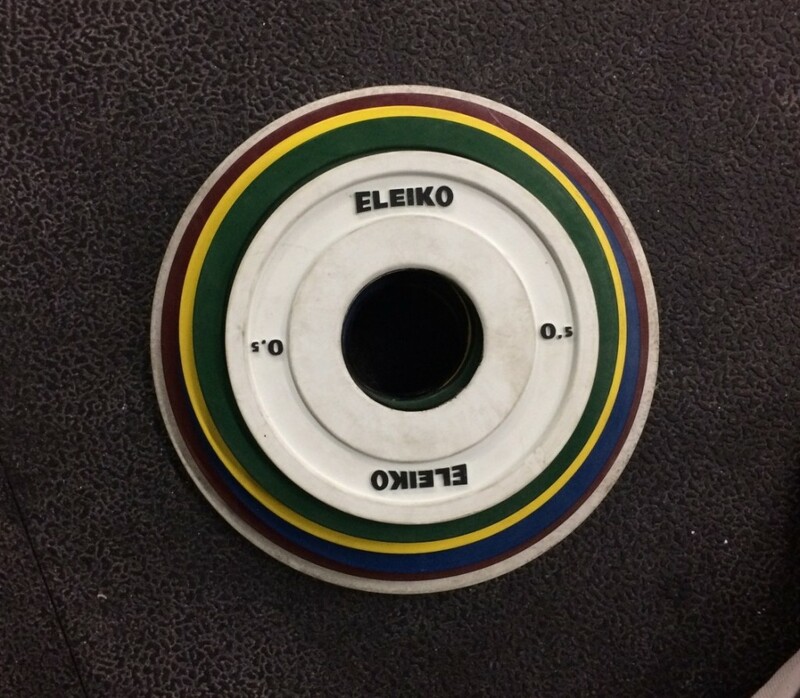 Previously a small-appliance manufacturer, Eleiko made a name for themselves upon the debut of their new bar in the 1963 World Weightlifting Championships. The Eleiko was the first bar to make it through an entire competition intact. Naturally, the next step was to create discs to accompany their superior bar. Eleiko is responsible for creating the first rubber-coated discs to the international competition circuit. 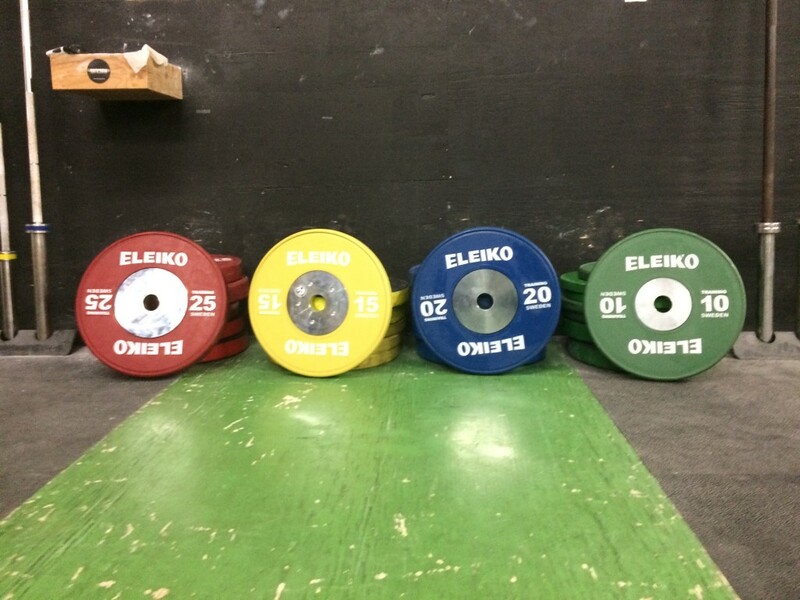 Showcasing their innovation and ingenuity, Eleiko was inspired to create their bumper plates after wrapping empty bicycle tires around the rim of a weight plate. The rest, as they say, is history. 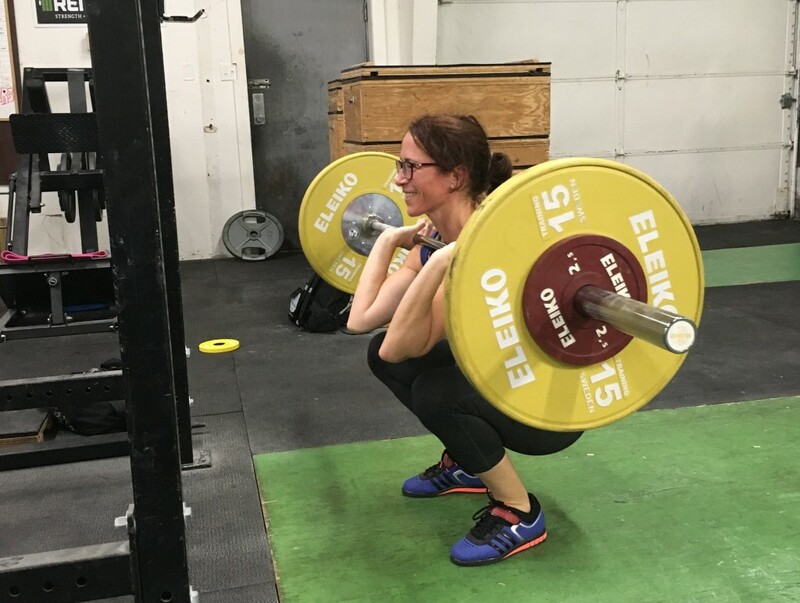 It’s this longstanding history of quality and superior design that inspired Renfrew Strength and Conditioning Centre to purchase an Eleiko set for weightlifting training and competitions. The full set includes plates ranging from 0.5kg – 25kg. 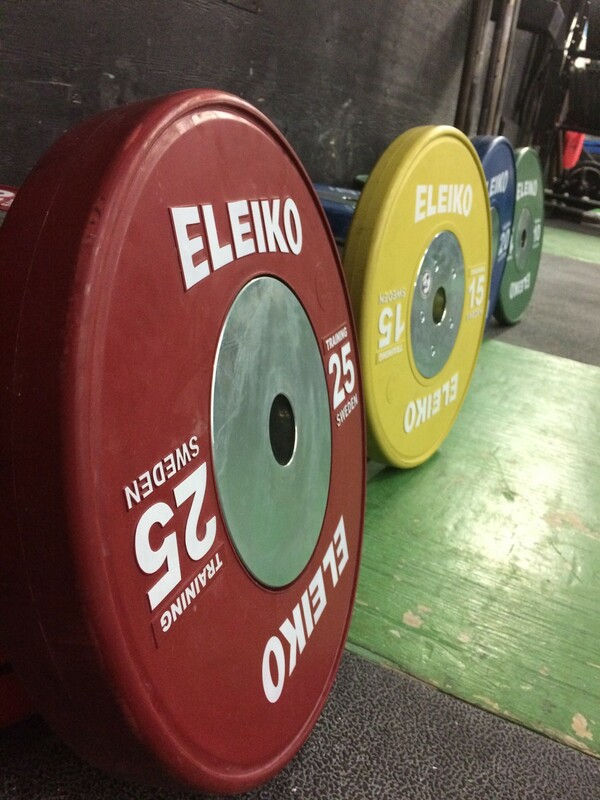 The most notable feature of the Eleiko plate set is their durability. Case in point being the fact that our new Eleiko set is sitting next to the plates from the 1980s that we’ve been using without an issue. With their sturdy design molded out of hard rubber, Eleiko plates are drop-tested 5000 times to ensure quality assurance standards are met. 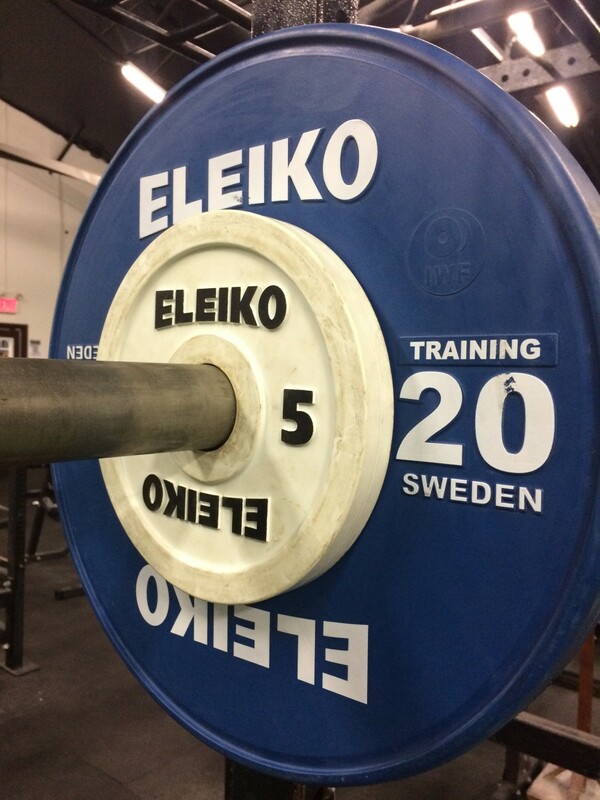 On average, our set of Eleiko plates are handled by twenty plus gym-goers a day, including a junior Olympic lifting class who are less than gentle with the weights. Another important durability factor that sets the Eleiko plates apart is their sturdy, two-piece hub, which is the loading apparatus at the center of the plate. In lower quality discs, the hub often consists of a thin piece of metal that is pressed into the rubber. With the continued agitation of dropping the bar or loading and unloading the plates, eventually, the piece becomes loose. The interior of the hub– the hole that slides over the bar upon loading– is also carefully crafted. Created to closely hug the bar, the plate allows only room enough for moving the plates on and off during loading. You can hear this function in action through the light friction of metal on metal. This feature reduces the damage caused by rattling when the loaded bar is dropped, increasing the overall lifespan of the product. You’ll notice that the 0.5kg-5kg plates don’t have this feature, as the small plates experience less impact. 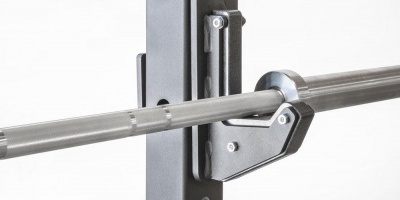 Beyond the durability of having a tight fit between your plates and bar, it’s worth noting the convenience of this function. Rather than constantly adjusting your plates after lifts, you’re able to proceed through your workout without pause. 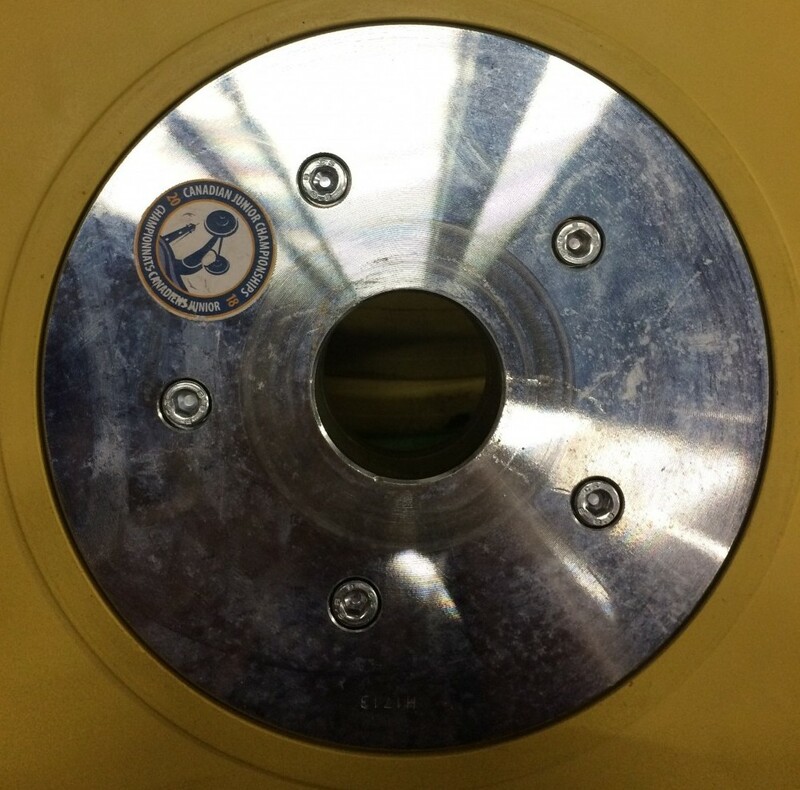 While many of the safety features of Eleiko plates are directly related to durability, the topic warrants a discussion of its own. As plates being to degrade, safety becomes an issue. I’ve witnessed it before with low-quality bumpers: the lifter completes an overhead lift, then drops the bar with a seemingly controlled motion. On impact, the one plate bends rather than bouncing. The other plate is still functional and bounces as it should. This causes the bar to pivot and roll out of the control of the lifter. Loss of control in this sense may not be of too much concern in a competition when you have a significant amount of room on all sides. However, most gyms–particularly home gym spaces– don’t have the luxury of room. This causes an increased liability for injury, particularly during team sessions. Eleiko discs, on the other hand, tend to bounce as expected. The added wobble of degrading plates can also cause injury to the lifter as they try to control the bar. The shift in the center of gravity caused by loose-fitting plates can change the trajectory just enough to tweak a wrist and cause damage. Ultimately, degradation fuels degradation and damaged plates can result in damaged barbells. The coloration of the plates is vibrant and eye-catching. The contrast makes it easy to quickly find and load the weight you need next. This function is especially critical at competition time. Unlike some other providers, Eleiko plates have an easy-grip lip around the edge, making them easy to maneuver. Again, this can reduce injury. We’ve already touched on the importance of having well-fitted hubs in terms of safety and durability. 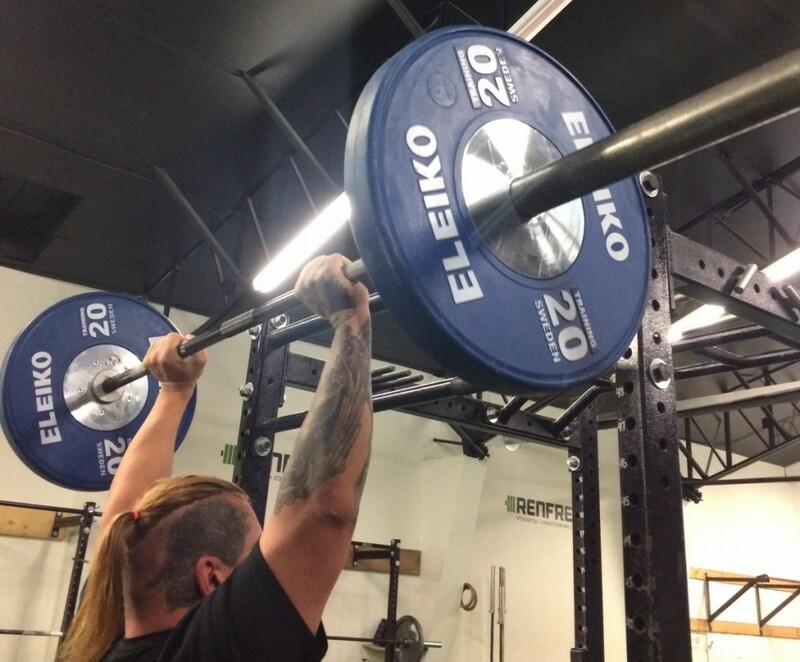 Despite their snug fit, the Eleiko plates are crafted for easy loading and unloading. The friction that helps keep the weight in place during a lift is a non-issue when it is time to slide them off the bar. When it comes to Eleiko, “cons” is a strong word. There are, however, considerations aside from the positive traits we’ve evaluated. First and foremost is the cost. 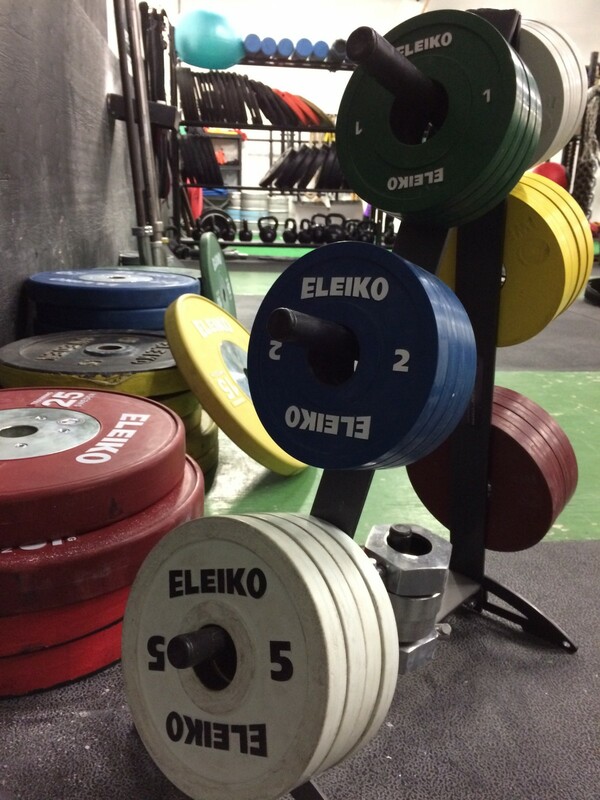 While the saying “you get what you pay for” remains true, Eleiko plates are a significant investment. Depending on which option you choose, and whether you decide to purchase a bar, sets cost anywhere from $2000-4000. You could start to build your collection slowly, but you’re still looking at spending anywhere from $200-350 per plate. If you’re serious about the sport, the investment is worth it. The bounciness of the plates is also worth mentioning. While this function can help reduce wear and tear, it is something to consider when making your purchase. Just remember that the bounciness will not only save your bar and plates but your platform as well. The less direct, weighted impact, the better the lifespan of your environment. Still, Eleiko recommends using 30mm thick rubber mats to absorb the shock. In fact, this is a necessity if you wish to maintain your five-year warranty (another perk of buying Eleiko plates.) While our plates haven’t been bouncing long, so far they show no evidence of degradation other than a few scuff marks. 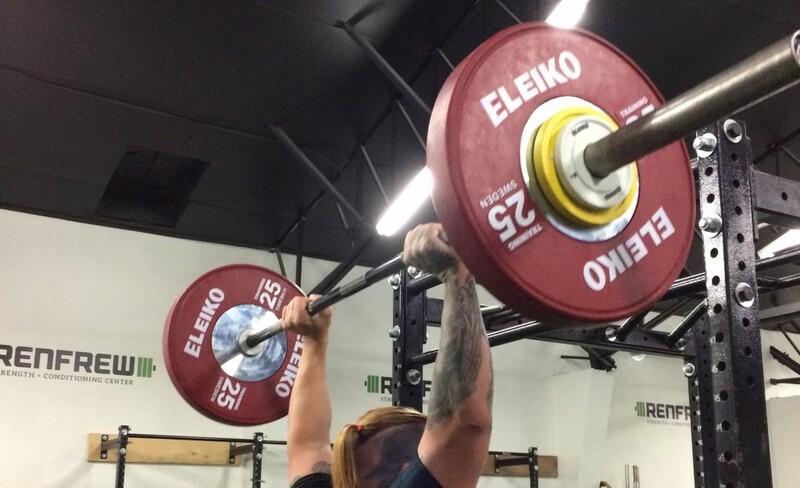 If you want the best possible plates for weightlifting, go with Eleiko. They really are the gold-standard for weightlifting. It’s also worth mentioning that as a powerlifter, I find them pretty nice on a deadlift bar too. If you have any doubt, tune into the Olympics in 2020 and see what they use. If you start saving now, you might be able to afford your own set by then! Editor’s Note: You can get the latest model of Eleiko training bumper plates from Rogue Fitness. Nikita Ross is a Precision Nutrition certified nutrition coach, ACE Certified Personal Trainer and professional fitness writer with experience in marketing, social media management, and ghostwriting. 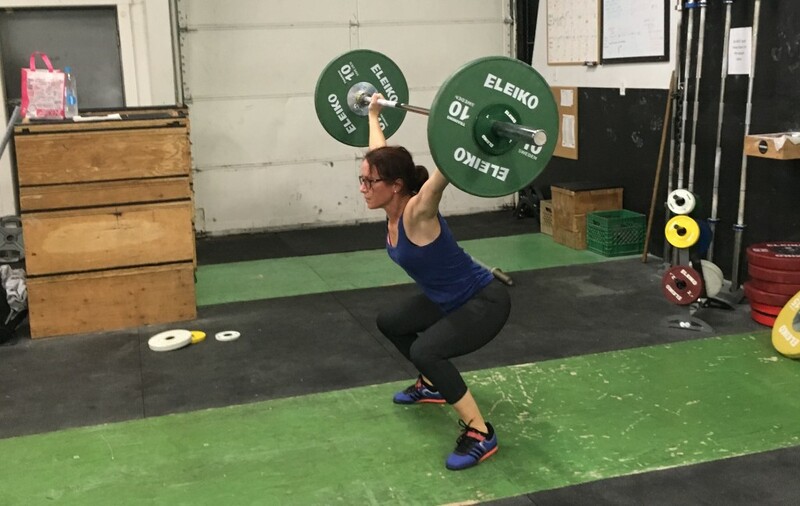 A mother, IPA World Champion Powerlifter, and self-proclaimed bibliophile, Nikita believes that lifting both barbells and books is the key to self-improvement. Visit Nikita at Strong in Body, Strong in Mind.